Ardtornish estate is committed to ensuring that your privacy is protected. Should we ask you to provide personal information (such as your name, address, email address etc.) when using our services (such as brochure requests, contacting us with a query or general correspondence, submitting an enquiry or paying the balance of your rent) then you can be assured that it will only be used in accordance with this privacy statement. When you request a page on the Ardtornish website, you send certain information, in accordance with the HTTP protocol, to our web server so that it knows where to send the data requested. This data includes the IP Address of your computer. This data is saved and analysed to provide useful information on the amount of traffic that to the website and the efficiency with which it is handled by our server. 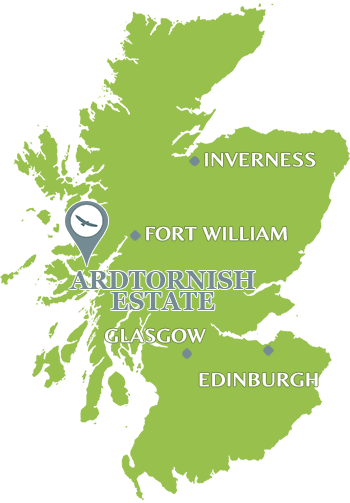 Ardtornish estate do not routinely use the IP Address for any purpose, however we do retain the right to do, so if necessary, to track down any malicious traffic designed to interfere with our servers (e.g. viruses). Your personal information will never be passed to anyone outside of Ardtornish estate without us first obtaining your permission to do so (unless we are obliged and permitted by law to do so). Part of these services may include sending you emails to enable us to administer the process of booking a holiday cottage, payments of rentals or informing you of Ardtornish estate promotions that may be of interest to you. We will normally store your personal information on our secure systems until such time as we no longer deem them to be commercially viable. If you request that your details be removed from our systems, so long as there is no outstanding action on any booking, we will be happy to do so. All the personal information supplied to us is held securely and in accordance with our legal obligations under the General Data Protection Regulation (GDPR) which comes into force on 25th May 2018. The security of all your personal information is of the upmost priority to Ardtornish estate. Access to your data is restricted to Ardtornish estate authorised personnel only, and the servers which electronically hold our company files are housed in a secure environment. Our internal computer network is protected by a firewall and backup/archive tapes are stored in a safe. When we ask for credit card, debit card or any other financial details, these are never held by the company and are encrypted before transmission to our payment gateway. We use Worldpay, a third-party leading global Certification Authority, to authenticate and certify the security of our website and to encrypt your card details. Ardtornish estate is committed to and will always endeavour to offer our customers the highest-level security when it comes to both their personal and financial information, however it is necessary to point out that ‘perfect security’ does not exist on and in the use of the internet. Those under the age of 18 years old are permitted to view are website and the information contained within it, however it is the policy of Ardtornish estate that those under that age of 18 are not permitted to book a holiday cottage, and therefore should not provide us with their personal details for this purpose. To provide further useful information to our customers, the Ardtornish estate website does contain some links to other websites which may be on interest. Please note however, that once you have used one of these links to leave our site Ardtornish estate does not have any control over that other website. Therefore, Ardtornish estate cannot be responsible for the protection and privacy of any information which you provide whilst visiting such sites, and such sites are not governed by this privacy statement. Ardtornish estate advises its customers and site visitors to exercise caution and look at the privacy statement that is applicable to the linked website in question. By using this site www.ardtornish.com you signify your acceptance of the terms of Ardtornish estates privacy statement as outlined above. If you do not agree to these terms then please refrain from using the site and exit it immediately. Your continued use of the Ardtornish estate website following the posting of changes to this policy, as outline above, means that you have accepted those changes.